Copthorne Hotel Dubai, the popular hotel located in Port Saeed in Deira, will begin enhancement work at the Horizon Health Club and the Gazebo Terrace, as part of the property’s continued effort to ensure the high standards of its facilities. The Dhs1-million refurbishment programme will transform the gym and health club into a modern and dynamic facility, aimed at motivating guests and local residents alike to be more active and follow a healthy lifestyle. The improvements will result in an improved floor space and layout of the gym and the installation of a brand new range of equipment from Cybex International, including the latest model of their cardio range. The addition of cardiovascular and strength equipment will allow guests and members to receive the maximum benefit from their workouts. The hotel is also planning to offer pool activities and gym classes during the winter months. An excellent place to enjoy the great weather, experience an al fresco dining experience at Gazebo Terrace overlooking the idyllic Dubai Creek and Dhow Wharfage. Perfect for a family get-together, the upgraded Gazebo Terrace will be furnished with contemporary lounge furniture and a children’s play area so parents can relax while the kids engage in different activities. Copthorne Hotel Dubai will introduce a new menu offering a selection of superb food and beverages such as succulent grilled meats, burgers, sandwiches, and light snacks complemented with refreshing thirst-quenchers, freshly made and prepared. Local residents can also book the Gazebo Terrance as venue for private events and functions such as wedding receptions, anniversary celebrations, birthday parties and other intimate family gatherings. Dining at Copthorne Hotel Dubai becomes a whole new experience with the opening of the new Gazebo Terrace, in addition to Crystal Restaurant, the all-day dining restaurant; Veri Peri, serving authentic Portuguese food and the Choices Café. “We are excited to present the new look of the Gazebo Terrace now that we are entering the winter season. The terrace is an ideal place to relax after a long day of meeting or shopping. One can sit and unwind by the pool terrace while looking at the amazing views of the Dubai Creek. It would be best if you come with friends, colleagues and families and share great food and beverages together,” added Nobbs. The refurbishment work is expected to be completed in December and the hotel ensures disruption will be kept to a minimum. 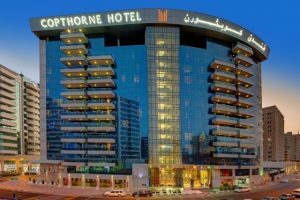 Once completed, the Copthorne Hotel Dubai will offer a whole new warm and friendly guest experience in keeping with its “More Than Meets The Eye” brand philosophy.